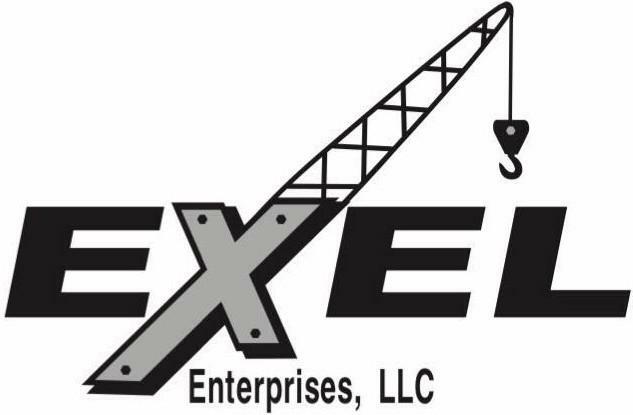 BULLS GAP, Tenn. — Volunteer Speedway will kick off the 2019 racing season with running of the ULTIMATE Super Late Model Series $10,000 to win Spring Thaw presented by EXEL Enterprises, LLC (Kingsport) on Thursday, April 4. The Ultimate Super Late Model Series fast-qualifier will pocket the $100 Appalachian Metal Sales (Casey Greenlee) of Mooresburg pole award. Racing besides the ULTIMATE Super Late Model Series will be the Fastrak Racing Series-sanctioned Crate Late Model, Sportsman Late Model and Open Wheel Modified classes. The ULTIMATE Super Late Model Series is excited to make their return to “The Gap!” The event will be a points race for the Ultimate Southeast, and Ultimate Heart of America regions along with a bonus race for our Ultimate Northeast, Ultimate Mid-Ohio Valley, and Ultimate Deep South regions. Reminder, a bonus event will give drivers the opportunity to replace a lower finish from their home region, with their finish in the bonus race. Grandstand gates open at 4 p.m. and pit gates at 3 p.m. Adult grandstand admission $25, kids 8-12 $10, with 7-and-under free. Adult pit passes $35, with kids 12-and-under $15. No lawn chairs allowed in the grandstands, only seat cushions. Also, no coolers permitted in the grandstands. ULTIMATE Super Late Model Series “Spring Thaw” purse: 1) $10,000; 2) $5,000; 3) $3,000; 4) $2,000; 5) $1,500; 6) $1,300; 7) $1,200; 8) $1,100; 9) $850; 10) $800; 11) $750; 12) $700; 13) $650; 14) $600; 15) $550; 16-24) $500. 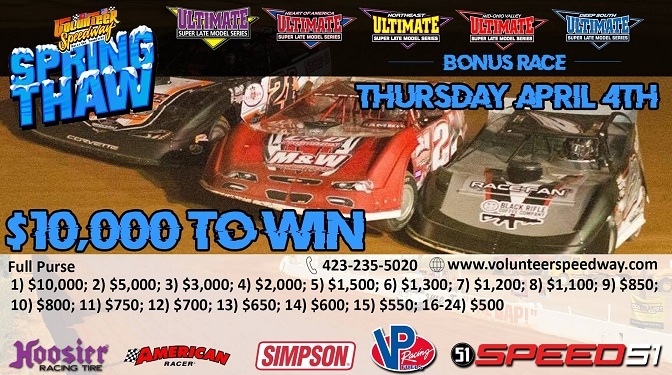 For more information on the ULTIMATE Super Late Model Series visit www.ultimatesupers.com or call series director Kelley Carlton at (864) 871-1442. ULTIMATE Supers are also on Twitter at @ULTIMATESupers Instagram @ULTIMATE_Supers and on Facebook at Ultimate Super Late Model Series. Volunteer Speedway is located at 14095 W. Andrew Johnson Hwy. in Bulls Gap, Tennessee (37711). For more information regarding Volunteer Speedway, contact Doug Gillenwater at (423) 676-9080.